LAKE ODESSA, Mich. — American Ethanol Late Model Tour officials have released an expanded 24-race schedule that takes the series to 13 tracks in four states. The season begins with the eighth annual Thaw Brawl March 29-30 at LaSalle (Ill.) Speedway. The Michigan portion of the schedule opens at I-96 Speedway in Lake Odessa, Mich., for the “Ice Breaker” on April 19. The wide four-tenths-mile oval offers drivers plenty of lanes for three- and even four-wide racing. From there, it’s a quick trip south to Plymouth (Ind.) Speedway on April 20. Crews will get a break ahead of a grueling May schedule that features eight races in four weeks in Indiana, Ohio and Michigan. The tour visits Indiana’s Montpelier Motor Speedway for the first of two shows on May 4. From there, it’s off to Ohio for a May 10 event at Attica Raceway Park and a May 11 race at Atomic Speedway. An Indiana doubleheader sees the series visit Brownstown Speedway on May 18 and Gas City Speedway the following evening. Michigan plays host to a Memorial Day weekend tripleheader with events at I-96 Speedway (May 24), Thunderbird Raceway (May 25) and Merritt Speedway (May 26). Hartford (Mich.) Speedway will host the series on June 21, with a return to I-96 Speedway set for June 28. July sees a July 5-6 holiday doubleheader at Merritt Speedway for the 31stannual Wood Tic, followed by a July 21 visit to LaSalle Speedway. 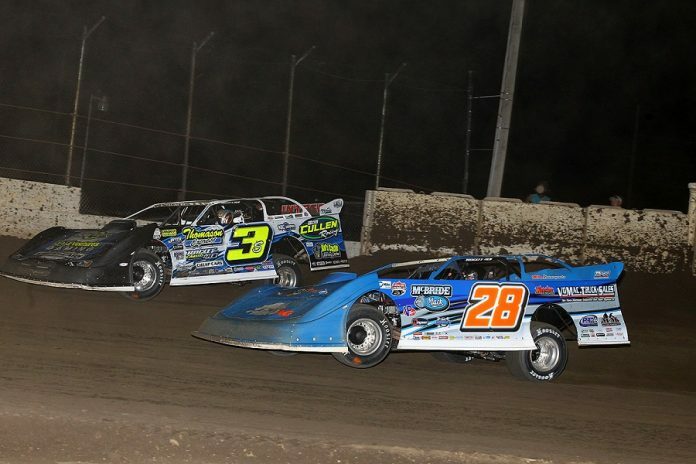 After an Aug. 17 stop at Montpelier Motor Speedway, the tour takes aim at Fairbury American Legion Speedway in Illinois Aug. 30-31. The season winds down in September with a trip back to Hartford Speedway on Sept. 14 before the final doubleheader weekend of the season Sept. 27-28 at LaSalle Speedway. The season concludes during the $5,000 to win Fall 50 at Atomic Speedway on Oct. 12. March 29-30 LaSalle Speedway LaSalle, Ill.
April 19 I-96 Speedway Lake Odessa, Mich.
April 20 Plymouth Speedway Plymouth, Ind. May 4 Montpelier Motor SpeedwayMontpelier, Ind. May 18 Brownstown Speedway Brownstown, Ind. May 19 Gas City Speedway Gas City, Ind. May 24 I-96 Speedway Lake Odessa, Mich.
May 25 Thunderbird RacewayMuskegeon, Mich.
May 26 Merritt Speedway Merritt, Mich.
June 21 Hartford Speedway Hartford, Mich.
June 28 I-96 Speedway Lake Odessa, Mich.
July 5-6 Merritt Speedway Merritt, Mich.
July 21LaSalle Speedway LaSalle, Ill.
Aug. 17 Montpelier Motor SpeedwayMontpelier, Ind. Aug. 30-31 Farmer City RacewayFarmer City, Ill.
Sept. 14 Hartford Speedway Hartford, Mich.
Sept. 27-28 LaSalle Speedway LaSalle, Ill.